Being in a car accident is bad enough when you’re alone, but if your spouse or family member is in the car with you, your concerns may quickly multiply. The top priority is obtaining medical care for all family members’ injuries. You may expect your car insurance company to pay for auto damages and your personal injury protection to cover medical expenses. Some insurance companies include a “family exclusion,” which can prevent family members injured in an accident in your car from collecting reimbursement, even if you are fully insured. 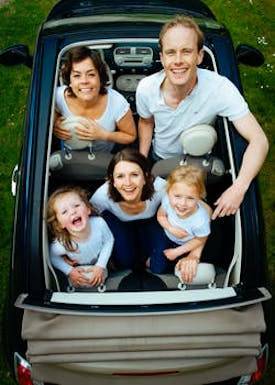 Historically, the family exclusion limitation was put into auto insurance policies to prevent and eliminate fraudulent claims. Insurance companies are attempting to decrease the amount of claims filed by two people cooperating in a deceitful way to purposefully cause damage which would be covered and paid for. This type of fraud is known as "collusion." However, the family exclusion can apply if a married couple, parent and child, or members of the same residence are in a car accident together. If you are the insured driver in an accident where your passengers are family members or roommates and they are injured, then your insurance company may restrict the monetary compensation to a percentage of the normal or needed amount, or the insurance payment may be capped at a pre-determined amount, regardless of the actual cost of the person’s injuries. We highly recommend you thoroughly read and review your insurance policies to see if it includes this exclusion for family and household members. Essentially, "interspousal tort immunity "is a common law doctrine which prohibits spouses from suing each other. The laws regarding interspousal tort immunity vary by state. Florida does not have this kind of immunity and allows for spouses to sue one another for negligent or purposeful actions. Therefore, in regards to car insurance and accidents, if you are driving in Florida and are involved in an auto accident which was caused by your spouse, there may be actions of lawsuits that you can take to receive compensation for your damages. If you are a tourist in Florida from another state and injured while visiting here, it is important that you consult a Florida auto accident attorney to understand the local laws and your rights for compensation. This clash of Florida tort law and family exclusions in insurance policies from out-of-state companies can become very complicated quickly. The experienced car insurance and personal injury lawyers with the Coye Law Firm know the options for litigation and the specifics of Florida tort law, and may be able to advise you about your rights and the process for seeking compensation for your injuries – regardless of who is at fault for them.